The Public Broadcasting Service (PBS) brought the subject of “killer stress” into international news when it aired “Killer Stress – A National Geographic Special with Robert Sapolsky.” Sapolsky, a Stanford University neurobiologist, highlighted his groundbreaking work on the effects of stress on both human and primate health, and his findings were grim. Stress is hard-wired into the human biology as part of the survival instinct. Perhaps best known as the “fight or flight syndrome,” stress in earlier periods of human evolution helped early humans identify predators and escape before becoming someone’s lunch. But today this same survival instinct is triggered many times a day by events such as critical performance reviews, traffic jams, a pending exam, or even being late to a meeting – incidents that far from immediately deadly, even if they are not ideal. What this means is that we simply must develop ever more refined stress identification methods and strong coping skills if we are to outlive our own survival instinct. These are just some of the documented effects that stress has on the human body, according to Sapolsky and his Stanford colleagues. Brain shrink. Prolonged stress can actually cause the brain to decrease in size. Belly fat. Elevated stress levels can cause fat to accumulate in both unsightly and dangerous ways around our midsection. This is a response to the powerful hormone called cortisol which is triggered in response to stress. Obesity, particularly obesity around the stomach area, is linked to a large number of chronic diseases such as heart disease, diabetes and strokes. Chromosomal mutations. The presence of stress can literally mutate our chromosomes. The Centers for Disease Control (CDC) cites a number of warning signs that can indicate the presence of rising stress levels. Becoming aware of and attuned to the presence of these warning signs can ward off prolonged and dangerous bouts of stress. A feeling of helplessness, frustration, numbness, or some combination thereof. Elevated levels of anger and irritability that can in time lead to violent thoughts or behavior. Inability to sleep or a constant need to sleep. Unexplained physical pains, from headaches to indigestion. Breathing or heart rate problems. Increased use of alcohol, nicotine, and other substances. The CDC also outlines important coping methods you can immediately begin to use in the presence of stress warning signs. Put yourself on a daily schedule. Regularly and routine can ease sleep disturbances and other stress-inducing issues. Take regular breaks to reconnect with nature and loved ones. Ask for help if you need it – from loved ones and/or trained professionals. Meditation. 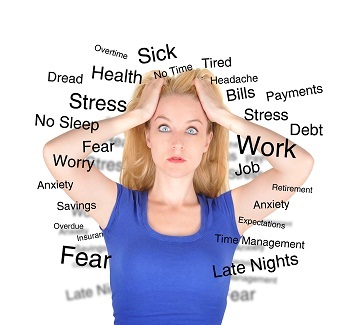 For many people, their stress levels are determined by their circumstances. Meditation is a powerful technique that has been proven time and time again to not only lower blood pressure and help people to relax, but also to help them become more detached from that which goes on around them. This allows people to be able to control the way they feel and their response to stressful stimuli. By understanding the root biological causes, warning signs, and recommended coping methods for handling stress, you can prolong your lifespan and improve your quality of life. Often, the things that stress people out are beyond their control. Losing a job, struggling to pay the mortgage, struggling to pay off other debts, relationships, their boss at work or a lack of sleep are some examples of this. Learning how to be aware when stress is beginning to appear and how to respond to it will pay huge dividends in the long-run for your health. Lucy James writes for ‘Online Mortgage Advisor’, specializing in mortgages for doctors and other healthcare professionals.